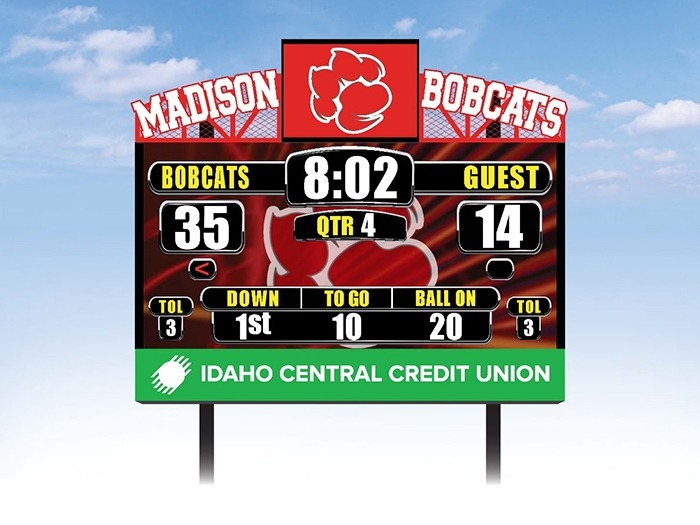 Madison High School in Rexburg, Idaho, will be the first in the state to install a fully digital football display from Daktronics. Alongside the display, the school is also the first in the state to incorporate a Daktronics sound system. The 12-by-25-foot video display and Sportsound 1500 audio system are scheduled for installation this summer. Vibrant, clear LED pixels make graphics, live video and pre-produced content easy to see from all sides of Bobcat Stadium, amplifying the game atmosphere. The Daktronics Sportsound system has clear, rich audio that carries across the stadium. When Jordan and other Madison High School administrators experienced the Daktronics sound system in Evanston, Wyoming, Busby said they were very impressed. Jordan said the video display is also a platform that will be used to feature student activities and for community events, including movie nights and concerts. Madison High School wants the students to get involved in game-day production after the display is installed. Plans for a sports marketing business class are in the works, Busby said. Brent McFarland, principal architect at JRW & Associates, said Daktronics exceeded his expectations with knowledge of balancing costs and options that kept costs and preferred features in mind. This dynamic display brings the Madison School District opportunities to bring in additional revenue to the school from advertising with more spots to feature sponsors.